^ Wagner, Erica (24 June 2015). 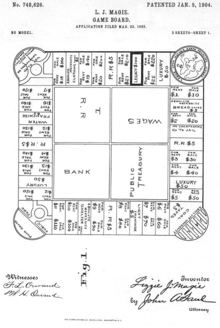 "Do not pass go: the tangled roots of Monopoly". New Statesman. 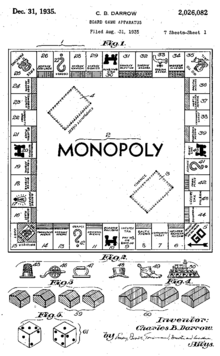 ^ US patent 2026082, Charles Darrow, "Board Game Apparatus", issued 1935-12-31, assigned to Parker Brothers Inc.
^ "Hasbro sues 'Ghettopoly' creator". NBC News. 22 October 2003. Retrieved 4 March 2018. ^ Kavilanz, Parija (10 January 2017). "Monopoly wants the internet to pick its next eight figurines". CNNMoney. Retrieved January 12, 2017. ^ "MICHAEL BOWLING V. HASBRO" (PDF). uscourst.gov. 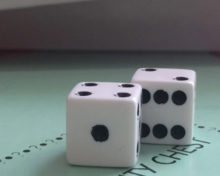 ^ "Fancy-dice maker sees patent case roll his way". tucson.com. ^ a b "Meow! 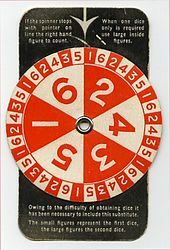 Hasbro unveils new token for Monopoly". CBS News. Retrieved 6 February 2013. ^ Kavilanz, Parija (17 March 2017). "Monopoly kicks out three classic game tokens". CNN. Retrieved 17 March 2017. ^ "MONOPOLY Luxury Diamonds slot machine—WMS GAMING". Retrieved 2018-02-02. ^ "WMS introduces MONOPOLY Bigger Event Big Money Spin". Retrieved 2018-02-02. ^ "WMS Gaming Expands MONOPOLY Licensed Offerings with Next Generation of Games Premiering Across Multiple Product Lines". Retrieved 14 August 2018. ^ "WagerWorks Monopoly Here and Now Casino Video Slot Game Review". www.casinoadvisor.com. Retrieved 14 August 2018. ^ "Itbox". Retrieved 14 August 2018. ^ "6 Things You Didn't Know About McDonald's Monopoly". The Daily Meal. 10 September 2014. Retrieved 14 August 2018. ^ "Family Game Night" (PDF). Retrieved 14 August 2018. ^ "'Monopoly Millionaires' Club' gets a premiere date -- exclusive". EW.com. Retrieved 14 August 2018. ^ "20 from N.J. chosen to appear on Monopoly Millionaires' Club game show". NJ.com. Retrieved 14 August 2018. ^ Graser, Marc (Nov 12, 2008). 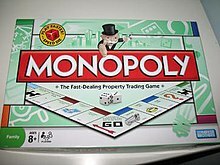 "Ridley Scott to direct 'Monopoly'". Variety. ^ "'Monopoly' has electric company". The Hollywood Reporter. Nov 12, 2008. ^ Fritz, Ben (January 30, 2012). "Universal-Hasbro deal fizzles with departure of 'Stretch Armstrong'". Los Angeles Times. Retrieved 6 February 2013. ^ Rich, Katey (February 7, 2012). "Universal Paid Millions To Not Make Hasbro's Board Game Movies". Cinema Blend.com. Retrieved 6 April 2013. 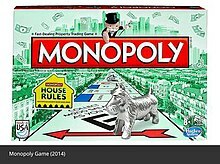 ^ "Frequently Asked Questions about MONOPOLY". Retrieved 2009-02-26. ^ "Anti-Monopoly". BoardGameGeek, LLC. Retrieved 13 August 2013. The "Bust~the~Trust!" Game. The basic idea of the game is to end the monopolistic practices of the three-company-combinations of the gameboard. The players are Trust-Busting lawyers going about the board slapping lawsuits on the monopolies. The winning trust buster is the one who ends with the largest number of social-credit points when one of the players runs out of money. ^ "BoardGameGeek – Gay Monopoly". Retrieved 2009-02-27. ^ "Micropoly – The Microsoft Monopoly Game". Archived from the original on 2008-05-30. 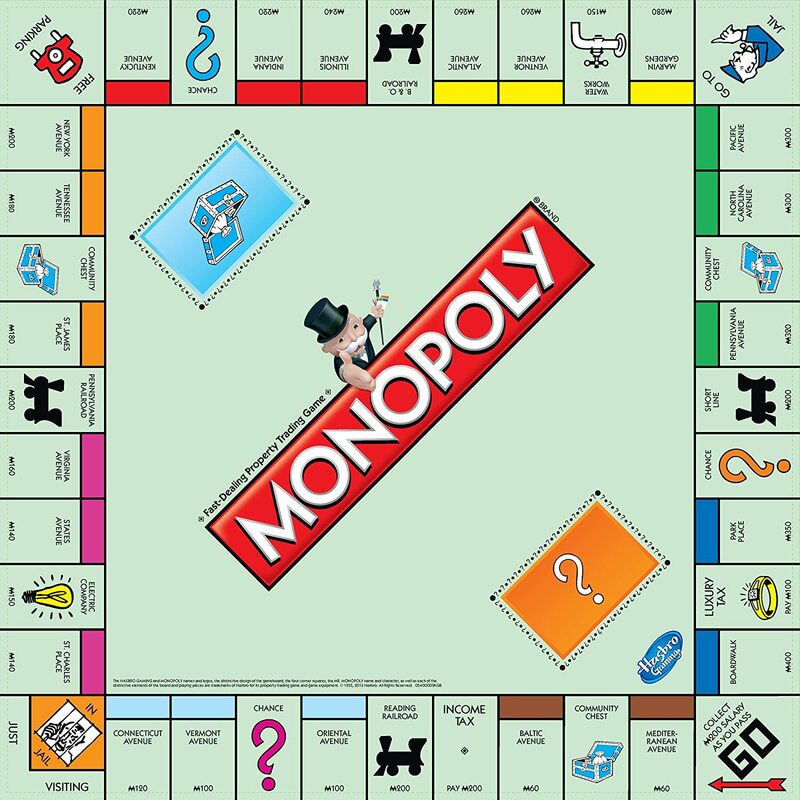 ^ "MONOPOLY – Deluxe Edition". Retrieved 1 August 2013. ^ Stromberg, Joseph. "The Jeweled Art of Sidney Mobell". Smithsonian. Retrieved 2017-12-07. ^ Calvin A. Colarusso (30 September 1992). Child and Adult Development: A Psychoanalytic Introduction for Clinicians. Springer. p. 88. ISBN 978-0-306-44285-8. Retrieved 25 June 2013. ^ Steve Bucci (28 July 2008). Credit Repair Kit For Dummies. John Wiley & Sons. p. 179. ISBN 978-0-470-27673-0. Retrieved 25 June 2013. ^ John Sommers-Flanagan; Rita Sommers-Flanagan (10 February 2012). Counseling and Psychotherapy Theories in Context and Practice: Skills, Strategies, and Techniques. John Wiley & Sons. p. 361. ISBN 978-1-118-28904-4. Retrieved 25 June 2013. ^ Ferdi Serim (14 December 2011). Digital Learning: Strengthening and Assessing 21st Century Skills, Grades 5-8. John Wiley & Sons. p. 138. ISBN 978-1-118-13107-7. Retrieved 25 June 2013. ^ Morris, Linda (2013-06-10). "Harmony now the name of the game". The Sydney Morning Herald. Retrieved 25 June 2013. ^ Lounder, Andrew (2013-05-07). "The Academic Graveyard Shift: IRS Provides Guidance on Identifying Institutional Peers". New America Foundation. Archived from the original on 13 September 2013. Retrieved 25 June 2013.